• Organic Cold Pressed of Rice Bran, Flaxseed and Sunflower. • Nutrient rich in Omega 3 & 6 and Tocopherols. 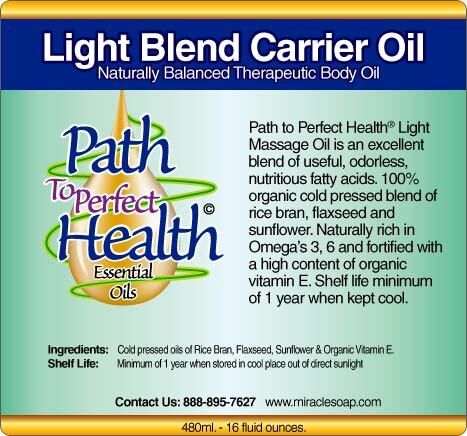 General Description: Path to Perfect Health Light Carrier Oil is an excellent blend of useful, odorless and nutritious fatty acids. 100% organic cold pressed blend of rice bran, flax seed and sunflower. These are naturally rich in Omega 3, 6, and fortified with a high content of organic Vitamin E.
Shelf life is 365 days when stored in a cool location out of direct sunlight. A carrier or base oil, lotion, gel or a natural soap is often used with aromatherapy treatments because these bases help distribute the precious, essential oils evenly onto the skin's surface. These bases hold the essential oils in place and give the skin time to absorb them into tissue, then to the blood and body fluids where they are carried to the lipid lining of the cells. Essential oils are volatile and evaporate quickly, so mixing and blending the essential oils in a carrier or base slows the evaporation and helps in absorption. The term used when an essential oil is applied directly to your skin without a carrier is called "neat." Many essential oils can cause a burning sensation when applied directly to the skin. Although this is not dangerous it can be very uncomfortable. Path To Perfect Health essential oil formulas that contain essential oils that might cause skin irritation have been pre-blended with the Path To Perfect Health Carrier Oil and are safe to apply them directly onto the skin from the 15 ml bottle. The carrier oil itself is valuable in many ways. The carrier or base must be pure with no petrochemicals and no synthetics or fragrances. Never take any chances if your are in question. The carrier oil is a combination of nutritive cold‑pressed natural oils. All carrier oils have lubricating properties with different viscosities and each individual cold pressed oil has its own specific healing properties. A good rule when blending your own product is to use 10 drops of essential oils to 1 oz. of base or carrier when you first begin. However, I have used up to 45 drops per ounce. Start slowly. And as you work with the oils over-time, you can increase the amounts. Mix small amounts of your aromatherapy products as needed, and use them up as essential oils are volatile and evaporate quickly. It is dangerous to store you pre-mixed essential oil products in most plastic bottles because the essential oils will break apart the toxic petrochemicals in the plastic and these toxins will leach into your product. Your wise choice would be to pickup some of the glass bottles we have available in the Accessory Section in our store. Path To Perfect Health Carrier Oil. Sunflower Seed Oil - Is 74% Linoleic acid, which is commonly used in making types of soaps, emulsifiers, and quick-drying oils. Linoleic acid has become increasingly popular in the health & beauty products industry because of its beneficial properties for the skin. Research points to linoleic acid's affective properties when applied topically on the skin which acts as an anti-inflammatory, which may reduce acne and hydrate the skin. It's high vitamin E content makes it especially helpful for delicate and dry skin. It is easily absorbed and can be used on all skin types. Flaxseed Oil - Is rich in Omega-3 fatty acids. Flaxseed oil comes from the seeds of a blue flowering plant that often grows on Canada's western prairies. In addition to being a rich source of omega-3 fatty acids, Flaxseed Oil also contains omega-6, omega-9, B vitamins, potassium, magnesium, fiber and protein. Rice Bran Oil - Rice bran oil is a great source of antioxidants such as Tocopherols, Tocotrienols, Gamma Oryzanol, Phytosterols, Polyphenols and Squalene It is a natural high source of vitamin E complex and other micronutrients. Vitamin E Oil - This is an antioxidant that will extend the shelf life of all the other oils and aromatherapy blends. It speeds up healing and assist in cell regeneration. It has been known to prevent scarring and may fade existing scars. It is very thick and works well when blended in with the other oils. It contains 100% d-alpha-tocopherol oil. Avoid dl-alpha-tocopherol as this is the synthetic form of vitamin E with far fewer healing properties.